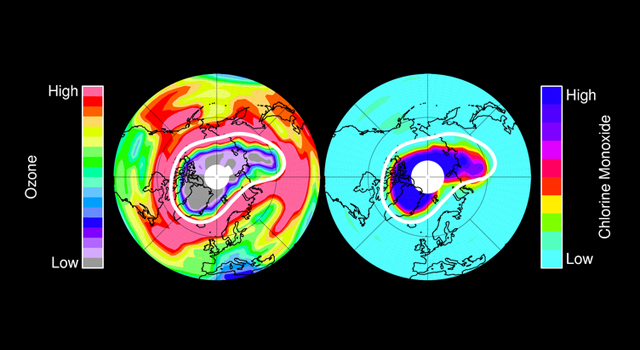 Oct. 2, 2011 WASHINGTON -- A NASA-led study has documented an unprecedented depletion of Earth's protective ozone layer above the Arctic last winter and spring caused by an unusually prolonged period of extremely low temperatures in the stratosphere. Other institutions participating in the study included Alfred Wegener Institute for Polar and Marine Research, Potsdam, Germany; NASA Langley Research Center, Hampton, Va.; Royal Netherlands Meteorological Institute, De Bilt, The Netherlands; Delft University of Technology, 2600 GA Delft, The Netherlands; Science Systems and Applications, Inc., Greenbelt, Md., and Hampton, Va.; Science and Technology Corporation, Lanham, Md. ; Environment Canada, Toronto, Ontario, Canada; Central Aerological Observatory, Russia; NOAA Earth System Research Laboratory, Boulder, Colo.; Arctic Research Center, Finnish Meteorological Institute, Finland; Danish Climate Center, Danish Meteorological Institute, Denmark; Eindhoven University of Technology, Eindhoven, The Netherlands; Arctic and Antarctic Research Institute, St. Petersburg, Russia; National Institute for Environmental Studies, Japan; National Institute for Aerospace Technology, Spain; and University of Toronto, Ontario, Canada.